Folk and traditional therapeutic use of the essential oil of English lavender for pain and relaxation dates back centuries. Lavender is rich in volatile oils and has been used historically both as a fragrance and medicinal herb. Linen bags containing lavender flowers were commonly placed under pillows for their alleged soporific properties. The name lavender is derived from the Latin lavare, meaning "to wash." In ancient Greece, Persia, and Rome, it was used as a perfume in baths and laundry and as an cleanser. Ancient Egyptians created mummification casts by soaking linen in oil of lavender containing asphalt, then wrapping the bodies with these and drying them in the sun until the casts were hard. Lavender has been renowned for its medicinal properties in India and Tibet. In Tibetan Buddhist medicine. Today, in Europe and the Americas, lavender is often used as an sleep aid to help soothe and relax. Alzheimer's agents: Small randomized controlled trials investigating the effects of lavender aromatherapy on agitation and behavior in patients with Alzheimer's dementia and vascular dementia (VaD) report conflicting results (40;​45;​50;​74;​75). 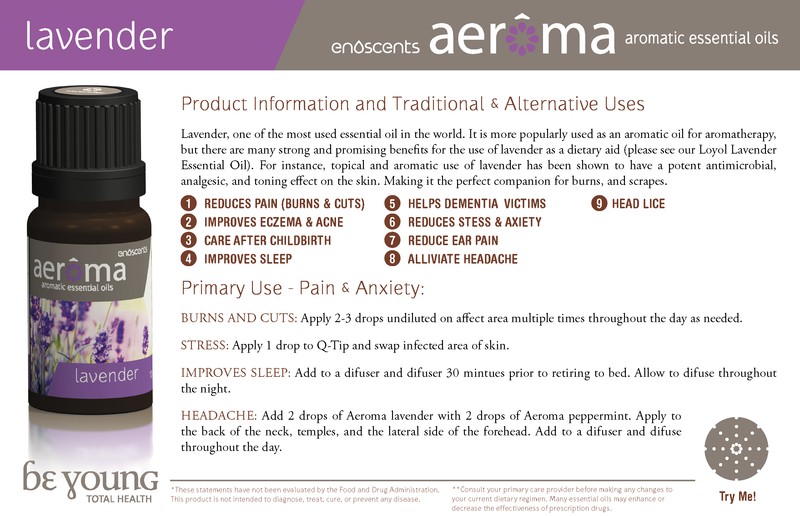 Analgesics: In human research, lavender oil had analgesic effects for pain reduction (36;​37;​39;​55;​59). Anesthetics: In human research, lavender oil had analgesic effects for pain reduction (36;​37;​39;​55;​59). Antiandrogens: In human research, three cases of prepubertal gynecomastia were reported in otherwise healthy boys topically applying lavender and tea tree oils, with resolution upon discontinuation, suggesting estrogenic and antiandrogenic activities (26). Antianxiety agents: In human research, lavender scent reduced tension-anxiety and confusion in various situations, including before surgery and dental procedures, with similar effects to lorazepam in some trials (24;​41;​48;​49;​76). Oral ingestion of lavender (Silexan) reduced anxiety in a randomized controlled trial (21). In a systematic review, one trial reported that oral lavender administered as a single dose of 200mL of lavender had an anxiolytic effect in low-anxiety conditions (p<0.05), but it lacked an effect on conditions of high anxiety (41). In human research, significant differences in self-reported anxiety were lacking with use of lavender during anxiety-inducing films or injections (42;​58). Antibacterials: In vivo studies suggest that lavender oil may have protective effects against various strains of nontubercular mycobacteria (4) and both methicillin-resistant Staphylococcus aureus (MRSA) and vancomycin-resistant enterococci (VRE) (3). In vitro, Lavandula angustifolia and Mentha piperita essential oils inhibited S. aureus against Escherichia coli O157:H7 and Staphylococcus aureus CECT 4459 and decreased bacterial growth in minced beef (77). Anticoagulants and antiplatelets: Lavender contains varying amounts of coumarins (27;​28;​29) and may therefore theoretically increase the effect of anticoagulant medications. Antidepressants: According to limited clinical evidence, lavender may have additive effects when used with antidepressants (73). In a randomized controlled trial, lavender decreased depression, but the benefit of lavender was significantly less than imipramine when administered alone (38). Antiepileptics: Lavender enhanced GABA effects and may therefore intensify the sedative effects of GABA-dependent antiepileptics. Antifungals: According to in vitro research, lavender oil may inhibit growth of Candida albicans and Trichophyton rubrum (78). Anti-inflammatories: In human research, treatment with lavender decreased the level of inflammation and ulceration after two days in individuals with aphthous ulcers (59). Antilipemics: According to animal research, cineole, a cyclic monoterpene found in lavender, may lower cholesterol via inhibition of the HMG-CoA enzyme (30;​31). Antineoplastics: According to a proposed mechanism of action, both limonene and POH, components of lavender, may inhibit tumor growth by blocking initiation and by promoting apoptosis (82;​83;​84). Antioxidants: Caffeic acid, a constituent of lavender, has been demonstrated to possess antioxidant effects in vitro (87). In vitro, Lavandula angustifolia and Mentha piperita essential oils applied to minced beef had the lowest thiobarbituric acid reactive substances (TBARS) values indicative of lipid oxidation (77). Antispasmodics: According to in vitro and animal evidence, cineole may antagonize acetylcholine-induced muscle contractions; linalool and linalyl acetate may induce cAMP-mediated smooth muscle relaxation (85). Cardiovascular agents: In women, lavender fragrance stimuli increased the parasympathetic tone, as determined by electrocardiographic monitoring (86). Also in women, lavender aromatherapy massage resulted in a reduction in blood pressure, although the effect of lavender alone is unclear (79). In human research, lavender decreased heart rate after injection (58). In human research, inhalation of lavender oil alone or in combination with bergamot oil resulted in a decrease in autonomic arousal, as indicated by a decrease in blood pressure and heart rate (80;​81). Dermatologic agents: In human research, topical application of lavender after surgery and following childbirth reduced erythema, compared with povidone-iodine (35;​36;​66). There have been case reports of mild dermatitis following the use of topical lavender oil (35;​67). Gastrointestinal agents: Gastrointestinal side effects, including nausea, vomiting, dyspepsia, gastroenteritis, eructation, breath odor, and anorexia, have been reported after oral doses of lavender (19;​20;​21), the lavender constituent perillyl alcohol (POH) (22;​23), and lavender oil (Silexan) (24;​25). Heart rate regulating agents: In human research, lavender decreased heart rate after injection (58). In human research, inhalation of lavender oil alone or in combination with bergamot oil resulted in a decrease in autonomic arousal, as indicated by a decrease in heart rate (80;​81). Hematologics: Reversible neutropenia has been noted after high oral doses of POH in patients with untreatable malignancies (on multiple chemotherapy regimens) (43). Hormonal agents: In human research, three cases of prepubertal gynecomastia were reported in otherwise healthy boys topically applying lavender and tea tree oils, with resolution upon discontinuation, suggesting estrogenic and antiandrogenic activities (26). Hypotensives: According to human evidence, lavender aromatherapy massage may result in a reduction in blood pressure (79), although the effect of lavender alone is unclear. In human research, inhalation of lavender oil alone or in combination with bergamot oil resulted in a decrease in autonomic arousal, as indicated by a decrease in blood pressure (80;​81). Neurologic agents: According to conflicting human evidence, lavender may reduce tension-anxiety and confusion (21;​24;​41;​48;​49;​76), reduce agitation and behavior in patients with Alzheimer's dementia and vascular dementia (VaD) (40;​45;​50;​74;​75), and depress the central nervous system (16;​17;​18). Photosensitizers: According to case reports, photosensitization and changes in skin pigmentation may occur after the use of topical products containing lavender oil (34;​63). Phytoestrogens: In human research, three cases of prepubertal gynecomastia were reported in otherwise healthy boys topically applying lavender and tea tree oils, with resolution upon discontinuation, suggesting estrogenic and antiandrogenic activities (26). Respiratory agents: Reports of bronchitis and influenza have been noted in randomized controlled trials of lavender (21). Sedatives: Lavender has been found to have sedative effects in animal models, and to act additively with sedatives, including pentobarbital and chloral hydrate (16;​72). In human research, lavender improved sleepiness at awakening after intervention (57).